The Rice Terraces of the Cordilleras (on the island of Luzon) ar a cultural landscape developed 2000 years ago by the Ifugao people. 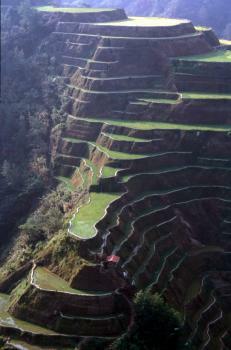 These terraces are still in use, and are under continuous maintenance by the current Ifugao farmers. There are many more rice terraces in Asia, but these in the Philippine Cordilleras are outstanding because of their altutude (up to 1500 meters) and steep slopes (maximum of 70 degrees). A complex system of dams, sluizes, channels and bamboo pipes keeps whole groups of terraces adequately flooded. My two days in the Rice Terrace Region of the Cordilleras got off to a bad start: rain was pouring down all of the first day. I didn’t get any further than the Banaue viewpoint, and returned to my guesthouse soaking and with only one gloomy photo of a rice terrace that even isn’t on the list. It kept on raining during the following night, but things didn’t look too bad the following morning. I decided to make an early start and head for Bangaan. By various means of transport, that even included climbing over a landslide that had occurred during the night, I eventually arrived at the town of Bangaan. It’s picturesque, there is no other word for it. Imagine a vally surrounded by high green mountains, with only steep rice terraces on their lower slopes, and a tiny hamlet in the middle. Or look at the photos around this post. There’s an enormous variation in shades of green (and some brown), wherever you look. Narrow walls / paths make it possible to walk amidst these rice fields. Because it’s not the rice harvesting season only fields with seedlings are bright green in December when I visited. But there’s a lot more to these rice terraces than growing rice: their construction technique (a massive effort for 2000 years ago) and also the traditions of the Ifugao people that still live here and earn a meagre income from the rice (and making a bit on the side by selling souvenirs). There are several more WH designated rice terraces in this area. The ones in Batad are the best according to both the guidebooks and the locals. My (self-imposed) travel schedule didn’t leave room for a visit of Batad or one of the others, but Bangaan already did let me conclude that these Rice Terraces are worth every effort of getting there. A good way to visit the rice terraces is to stay in Banaue, a small town in the middle of the Cordillera mountain range. Banaue can be reached directly from Manila or nearby bigger cities such as Bontoc, Sagada and Baguio. I took a Jeepney from Sagada which was full so I had to sit on the roof. Although very uncomfortable it was an amazing experience. 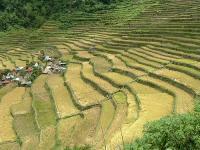 From Banaue it is relatively easy to arrange visits to the rice terraces. The easiest way is to hire, either privately or through the local tourist centre, a car or a trike (little motorcycles with side cars) to get as close as possible to the sites. The Hungduan terraces are completely made of mud walls and said to look like a giant spider web. I found them impressive, but I couldn’t see any resemblance to a spider web. The next day I hired another trike to visit Bangaan and Batad. I was first taken to Bangaan, which is on the road from Banaue to Mayoyao. Bangaan is a typical Ifugao traditional village and it’s located at the bottom of a small valley whose sides were transformed into rice terraces. It is very picturesque and from the top it looks like a fairy tale village. After Bangaan my driver took me to Batad. Batad rice terraces are known as the amphitheatre-like terraces. Once I got to see them I immediately understood why. These amazing rice terraces were carved into the sides of the mountains around 2000 years ago and are still a truly stunning sight. 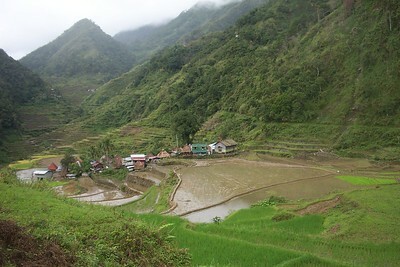 While Banaue and Hungduan rice terraces are mud-walled, Batad rice terraces are stone-walled. It is possible to walk along them, go up and down on the paths used by the locals to work the fields and admire the incredible views from anywhere in and above the amphitheatre-like valley. The village, and the lodges overlooking it, also offer a few places to eat and have some refreshing much-needed drinks, after the tough hike and the heat of the Philippines. The bravest, with still some energy left after the numerous ups and downs along the terraces, can go to the viewpoint, the highest point of the amphitheatre, which is on the opposite side when reaching the village from the Saddle. It is impossible to miss the steps that climb to the viewpoint as, seen from far away, they look like a frightening scar along the side of the mountain. However, the view from up there is unbeatable. The valley can be seen in all its imposing beauty. It was hard, but it was worth every drop of my sweat. The rice terraces in the Philippine Cordilleras illustrate how cultural traditions were preserved with continuity and endurance. According to UNESCO, archaeological evidence shows that the terraces have been in the region for about 2000 years virtually unchanged, although other sources believe that terracing began in the Cordilleras less than one thousand years ago as taro cultivation, before taro was replaced by rice around 500 years ago. In any case the rice terraces are an outstanding example of sustainable use of the natural resources, able to produce food for a local community. They represent the work of a community that has been in harmony with its environment for hundreds of years. I visited the Rice Terraces in October 2007. The Rice Terraces of Banaue are easily the most impressive attraction in the Phillippines. The terraces were built over the course of centuries, and the locals like to describe it as the "largest thing built by free humans", which is a dig at the pyramids. Getting to Banaue takes a bit of time, as you have to go up winding mountain roads, but it isn't too challenging. When I visited in 2007 the only real hotel option was a tourist hotel built during the Macros regime. If you have to ask the question "what should I go see in the Philippines? ", I'd put the Rice Terraces on the top of your list. 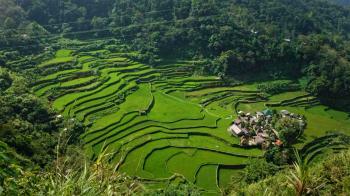 Read more about the Rice Terraces of the Philippine Cordilleras on my website. I just recently came from a trip in Ifugao. I was lucky enough to have been guided by a British friend of mine who owns an inn in Uhaj (overseeing the Hungduan Rice Terraces - WHS, which is largely regarded as the first and oldest of the rice terraces clusters in the area). I was able to visit the rice terraces in Banaue, namely Batad and Bangaan in a day -- these two clusters share the same route so maximizing the opportunity to see 2 WHS clusters in one go is a give away. Batad Rice Terraces gave me the impression of might and boldness. Among the 5 clusters inscribed as WHSites, Batad probably holds the steepest terraces (from a distance, it practically looks like a cliff). It's ampitheatre-like landscape is stunning. Going there requires some time and strength as the traveling would consume about 2.5hours, including trekking to the site. On the way back to Banaue town proper, we made a quick visit to Bangaan. Bangaan, on the other hand, is humble and unpretentious. A part of me, in fact, is convinced that Bangaan has a better character than Batad and Hungduan given the landscape and the topography it is located in. Bangaan is a colorful site as with its varying shades of green and brown fields; its small village is also intact in the middle. By and large, the rice terraces of the Philippine Cordilleras are truly amazing and are among the best cultural landscapes there are to find. It is also worth noting that their traditional epic, called "Hudhud" is also inscribed by UNESCO as one representative of Oral and Intangible Heritage of the World. I guess, this - among other things - fortifies its claim as a living cultural landscape. Also, although not analogous, the rice terraces might be the Philippines' best bet in comparison to the ancient pre-colonial vestiges (Ayutthaya, Angkor, Borubudur, etc.) in the neighboring Southeast Asian countries. To a large extent, the rice terraces are even the oldest stone structures in Southeast Asia. 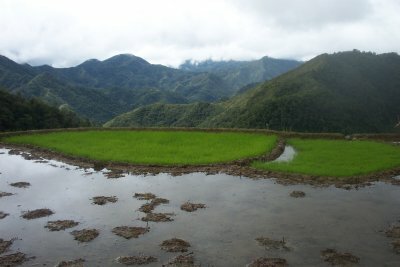 Visited Batad and Bangaan rice terraces last February 2010. Such an amazing experience! Stayed in Batad Homestay c/o Mang Ramon who can offer the "rice terrace" experience - like preparing rice, bonfire activity, rice wine ceremony at night, staying in one of the native huts. Apart from the external factors affecting the site, i.e., climate change, El Nino phenomenon, it appears that the problem is internal. 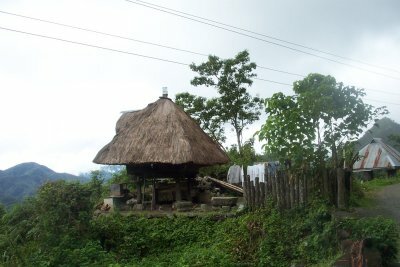 The younger Ifugao may have misinterpreted the concept of modernization. Based on the conversations I made with the locals, I learned that a lot of the young people feel that working in big cities and earning money is a sort of "escape" so they won't need to learn all the rituals and techniques in rice planting. The rice terraces are still beautiful despite all the problems threatening their survival. It was a great place! We went there and it was so big - no wonder it is a heritage site! WE visited the farmers, then took a look around. You should fly a plane there - the views are AMAZING! Also, the degration is quite serious. I think it should be partly closed off to visitors. Hello I was at the Banaue Rice Terrace in 2002 March with my wife who is a Philippino. We were so happy we took to time to see this place. I read a few of the other comments and they are right in saying this is amazing to see such engineering. On the return walk back to the peak we stoped at the hut for lunch and watched the terraces for a good hour before leaving. I used to watch these terraces on TV documenarys so it was a very speacal time for me also for my wife to be there to see them and walk on them. The locals are so hard working and happy looking. As we walked back up the mountain feeling sorry for ourselves as our legs weakend we saw many of the locals carrying sacks of rice on their backs keeping pace with us! Tough as billgoats knees they are! The only thing I found frightning was the drive from Baguio to Banaue at night. We started in the evening and the mountain road made me so scared. When night came I just hung onto the hand rail and just waited to tumble over the side into a valley. The ride was something like 12 hours. But I was astonished when I turned on the GPS to find we where only aprox 75kilometres from Baguio! Your basicly turning and swerving around the mountain top roads. I hope anyone who ventures there has a great time as we did. I've just been to this WH site last weekend and the journey itself was an adventure. From downtown Banaue, we rented a tricycle. It was already noontime and the local we've asked about the trip was quite suprised that we'll be going there late that day. I was thinking it would just take us max of 2hours and we'll be in Batad. After about an hour of driving through very rough terrain, the tricycle driver finally stopped and asked that we walk our way to Batad. At that point, I didn't see any rice terraces anywhere so I asked how far the place was. I saw the grin in his face when he said we just need to walk and we'll see the community in no time. This was the longest trail I've ever walked in my entire life. An hour of rough and stony road, and yet no signs of rice terraces. So much for watching too much TV, I thought it was that simple. Finally, we saw a small hut just a few meters away. I can't believe we made it. There was a jeepney parked, few men offering to be trek guide and a small store with drinks to offer. Imagining how far we've gone and how many mountains we've crossed, I was suprised that they have several beverages, the same stuff sold in city supermarket. We stopped for a few minutes, to rest our feet and replenish with lots of water and energy drink. Finally, we asked where to head next since still, I didn't see a community nearby. To my suprise, a local pointed a red roofed house across a huge mountain, and told us that that was our final destination. My jaw dropped. I can't believe it was that far. From where we stood, it looked to me like an endless foot trek, several mountains ahead. We were half the journey and sadly, there's no way backing out. With all the courage and strengths, we started yet another hour of walking up and down the mountains. Fast forward, after another hour, I can't believe we made it. At first, we found a place to rest and eat. We were so starved by that time. By the time we have finished our meals and rested a bit, that's when I saw the magnificent landscape. It's hard to believe that those rice terraces just in front of us were man made. They were so lovely, you would just stop and stare and wish to live in the same community. Needless to say, the local were so friendly and accomodating. And the sincere welcome smiles they give were enough to forget the journey. Too bad, we just have an hour to spare and we needed to head back just in time to catch a bus that will bring us back to Manila. But I promise to be back but this time, stay longer probably a couple of nights to have a solemn and peaceful vacation in this beautifully sculpted mountains. Rice Terraces in Banaue town is quite a disappointment compared to the ones in Batad Village, it's really beautiful there, but getting there takes effort. you have to hike from the junction where the road ends to the saddle for about 40 minutes to an hour and from the saddle to Batad Village is an hour down the mountains. the view and the village is really really awe inspiring and just glorious. no words. there's a beautiful waterfalls in Batad, another one hour hike from batad village. batad rice terraces is the best rice terraces i think in whole ifugao province. I agree with Ivan ManDy’s evaluation of the Philippine Cordilleras. As I write this review I am looking above my monitor at a wonderful piece of handwoven Ifugao cloth hanging on the wall with its bright reds, blacks, whites and yellows. It is one of my better WHS souvenirs and brings back visions of green rice terraces and peasant girls wearing wearing wrap round skirts of the same cloth. If you do go then by all means visit the “classic” viewing point above Banaue on the road to Bontoc (photo). This however is rather touristy and is packed with old Ifugao ladies puffing enormous pipes waiting to be photographed! So try also to visit some of the lesser known valleys away from the tourist trap of Banaue. We had a rent-a-car which made this easier though it is better still to take to the footpaths. Driving in the Philippines among the “Jeepnies” which give no quarter in the battle for road space is an experience in itself. Indeed the Philippines has a lot going for it as a tourist destination – and the Rice terraces are certainly “worth the journey”. 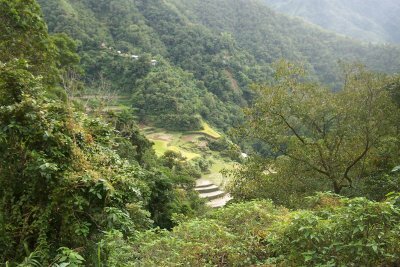 However Ivan ManDy is only partially right in his assertion that the Philippine Cordillera was the first “Cultural Landscape” site to be inscribed. It was indeed the first to be so inscribed from scratch and the first purely on cultural criteria but Tongariro in New Zealand was re-designated a “Cultural Landscape” in 1993 as was Uluru in Australia in 1994. Both had been WHS on purely “natural criteria” since 1990 and 1987 respectively. Sintra in Portugal was also inscribed as a cultural landscape in the same year as the Philippine Cordillera but is numbered “1” later! This raises a number of issues about the definition of “Cultural Landscapes which WHS enthusiasts might find interesting! Whatever the esoteric debates about the category and what it means the Philippine Cordilleras site transcends them and is surely unarguably “world class”. Fowler writes “..the terraces of the Ifugao have remained a standard-setter since 1995, for they represent the quality against which all other potential WH cultural landscapes can be judged”. 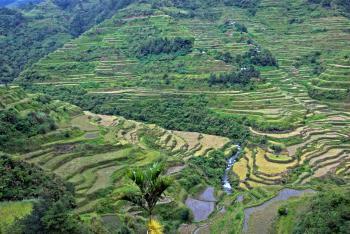 The Rice Terraces is (if Im not mistaken) the first world heritage site of UNESCO under the 'cultural landscape' title. It was only when I visited it for the second time (and explored further) did I realize the great extent of these terraces! The expanse is truly amazing - one town to another can take as much as 4 hours to reach by car! And to think that these terraces were carved in the mountains by hand! Only when you visit the Rice Terraces can you realize the primal importance of this crop to Filipino (and Asian) culture. I have been doing documentaries on most places and cultures in the Philippine Cordilleran Region and have gone about the rice terraces of the Mountain Provinces and of Ifugao. Looking at the stark wonder of it all would make one sad with the realization that this culture is slowly going to dust. With hard life ahead and modernization eating up every corner of the world, we should make efforts to preserve what is left of the past. That the future generations may have something to appreciate. Lack of funding to do all these is a very big problem, but I guess a little wonder at a time could make a difference. Educating the youth, community rehabilitation campaigns and programs, culture and tradition immersions, environmental missions, these all can do a lot. The Rice Terraces are really a stunning piece of landscape architecture. Only when you walk on the terraces itself can you realise the great expanse of the place. My hats off to the Ifguao people who built this cultural landscape! With the amount of 'modernization' going through the place, I just hope I'll still be able to visit it afterlife (in the next 1000 years)! There is a plan to construct a road to Batad where the most beautiful part of the terrraces are found. The plan should be discouraged. Else, the awesome natural beauty would be permanently lost to the invasion of distractive technology like those which sprouted in Banaue central. The rice terraces are already showing signs of irreversible degradation especially those in that are accessible to land transportation. Structures are indiscriminately built on the terraces areas. Some areas are abandoned as people leave the place in search for more economically viable livelihood activities. The rice terraces is taken cared of by the older people with the younger generation getting aversed to terrace work as they get more educated. When nobody is willing to work in the rice terraces, that means the end of this heritage. Yet the national government is not concerned as shown by its abolition of the Banaue Rice Terraces Task Force and passed on the responsibility to the Provincial Government. The Provincial Government is so cash strapped that it depends on funding allocation from the national government with no other fund sources. Irrigation and drainage: Gravity-fed irrigation system, utilizing water from aquifers in the forests 2,000 feet above. Built in the 1st century: "lt is believed that terracing began in the cordilleras some two thousand years ago" (AB). In fact it is not known when the terraces began to be constructed and the issue is closely tied to the variuos theories about immigration patterns to the Island. Elsewhere it is stated that construction goes back 6000 years.